ISLAND IMAGES » Christmas came early to the children at the Loliana Family Shelter on Quinn Lane yesterday as Santa delivered presents collected by students from Sacred Hearts Academy. 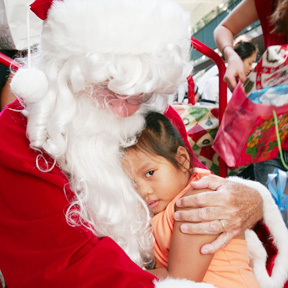 Kiara Gerardo, 4, embraced Santa after she received her gift. A court rules the state illegally denied, and could be forced to pay, 9,000 in Hawaii. A federal crackdown results in 19 arrests around the country. Several collections released this year offer a local spin to seasonal standards. The defending champ scores a 9.87 on his best ride of the day. Aloha Airlines hopes to get past the last obstacle that blocks the carrier from getting out of bankruptcy. Property values on Oahu have increased about 26 percent over the last year.